I have been a great fan of McIlhenny Company‘s Tabasco® Brand products for many years and have always wanted to visit Avery Island, LA to take a tour of the birthplace of their lovely and peppery elixir. I have been known to use the original Tabasco Sauce so much that my father bought me a gallon jug of it once for Christmas. It is a staple ingredient in my kitchen and something of a secret ingredient because it adds flavor and I use it in such a way (sometimes) that people don’t always notice it, they just say “Wow, that’s yummy!” And, I also own a Tabasco necktie. Recently they introduced their Tabasco Brand Buffalo Style Hot Sauce to the world and I am looking forward to trying it out, soon. The heat level ranges from 300-900 Scoville Heat Units (SHUs), which you can see in the chart is much milder than most of their other sauces and is considerably less heat than I usually require. So, I’m thinking I will have to spice it up some. Tabasco Sauce Rules! I could eat it on Ice Cream. I love that Tabasco keeps their ingredients simple and natural. 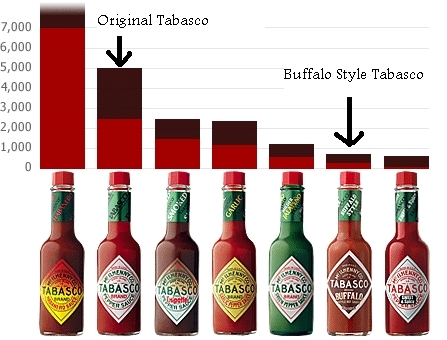 Tabasco Brand Buffalo Style Hot Sauce has red cayenne pepper, salt, water, distilled vinegar and garlic listed as the ingredients. Did you say garlic? I love anything with GARLIC in it. But, wait! It only comes in 5-oz. bottles? What? Really? There is no way that would last for even a dozen or two chicken wings. I truly hope they will come out with a 12 ounce version. Seriously now. The sauce is described as thicker than their other sauces, is cayenne-based, and is not just for wings, but could be used in a variety of ways; including as a dipping sauce, on burgers or sandwiches, on the BBQ or grill, or to add some zing to a baked potato, or anything else for that matter. Tabasco already has several recipes available. At the time of this writing, it is not available in stores yet. Boo hoo hoo. The good news? It is available online at the Tabasco Country Store. Want to try it out for FREE? Well, sorta kinda free. They are including one FREE 5-oz. 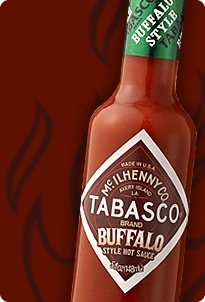 bottle of Tabasco Brand Buffalo Style Hot Sauce with any online order. Just enter code BUF on the shopping cart page when you place your order. If you happen to be in the food-service industry you should be able to get it in bulk (case of 12) from your vendor. Another good tip for those who love their Tabasco Sauce: GET a COUPON for money off of your next bottle. One last caveat. No, it does not come with the cool bottle top with buffalo horns shown in the main picture for this article. But, it should and I am going to write them and let them know. I would buy it simply for that and just recycle the bottle for Tabasco Sauce! Oh – maybe one more caveat. You may also want to see the video for the Guinness Book of World Records winner for Most Tabasco Sauce Drank In 30 Seconds. Think you can beat it? I think I can. I’ve always wanted to set a World Record. I think I have a strategy. Hmm. Remember. Eat like a God! 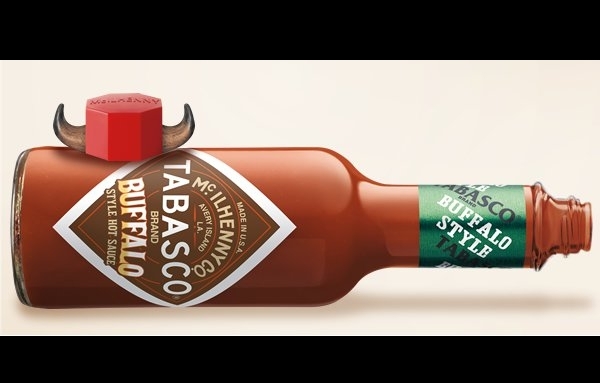 The TABASCO® marks, bottle and label designs are registered trademarks and service marks exclusively of McIlhenny Company, Avery Island, Louisiana 70513. Images are also from the McIlhenny Company – one of which was slightly modified for this article by the writer for visual purposes.